We are soliciting proposals for legal services for the voters of Duluth, Minnesota who have been denied the chance to vote on the biggest school building program in Minnesota history. For a year and a half we have appealed to a dozen governmental entities for help from Duluth ’s School Board to the Governor’s office. While we have often found sympathy none of these entities felt empowered or inclined to take up our cause. We must turn to the Court for redress. Attached is an abbreviated history of the $293 million “Red Plan.” It describes a number of legal issues which we believe could be successfully litigated in order to force a referendum or delay construction until the voters of Duluth elect a new school board. Our only consideration in hiring legal counsel will be our confidence in their ability to accomplish either or both of the aforementioned goals. Such is the fury of Duluth ’s voters that an ongoing appeal for funds to hire legal counsel has exceeded our expectations. 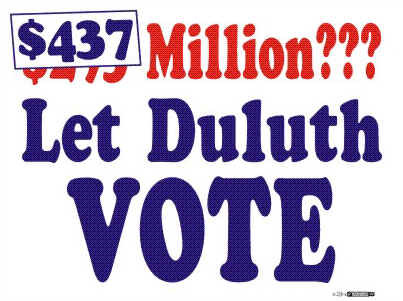 Let Duluth Vote feels a sobering responsibility to defend the rights of the thousands of people who have placed their trust in us with their hard earned money. Our attorneys must be prepared to have a case prepared so that the courts can take action before the spring construction season begins. This will require familiarity with those laws which will become central to any legal challenge. It is possible that we will engage attorneys to pursue separate legal tracks should additional promising legal challenges present themselves. 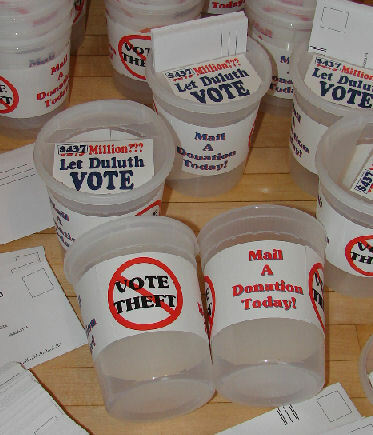 In fact, Let Duluth Vote is already helping fund another local group which is fighting the Red Plan through its attorney, Grant Merritt, a former Director of Minnesota’s Pollution Control Agency. 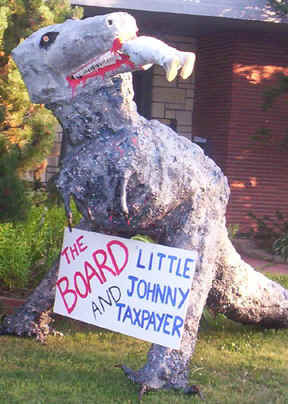 Unlike the school board, Let Duluth Vote can not impose legal expenses on the taxpayer so fees are a consideration. The offer of some pro bono representation would be greatly appreciated. So too would proposals outlining legal challenges that might result in the school district being ordered to pay Let Duluth Vote's attorney’s fees. We believe this could happen if a civil rights case was pursued. Our committee would like to have an opportunity to interview prospective attorneys in person or perhaps by teleconference. Inquiries and or proposals should be directed to our Legal Advisory Committee. We strongly recommend contacting the Committee’s chair, Harry Welty, by phone or by email to hasten communications. Additional information can be found at: www.letduluthvote.com. Please read this brief history of the Red Plan with links to some of the documentary evidence supporting our position.